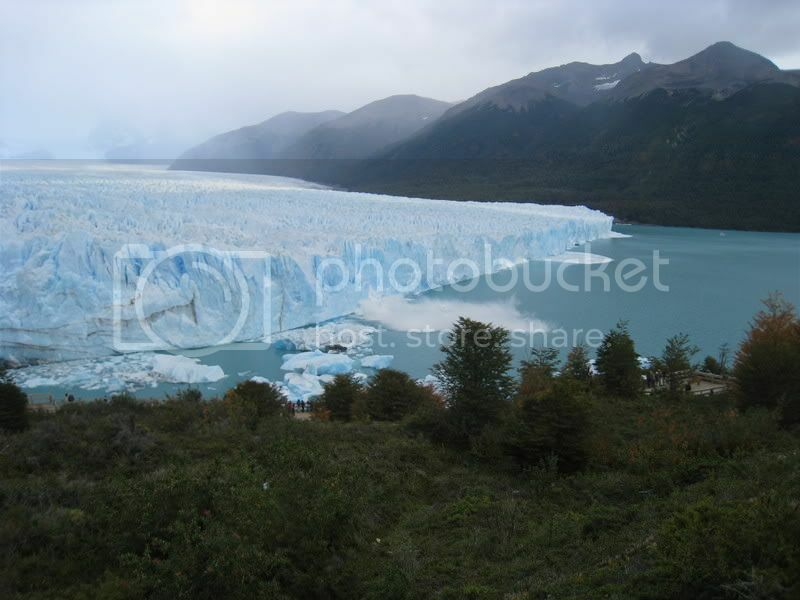 We flew from Buenos Aires to El Calafate in Southern Patagonia near the border to Chile. 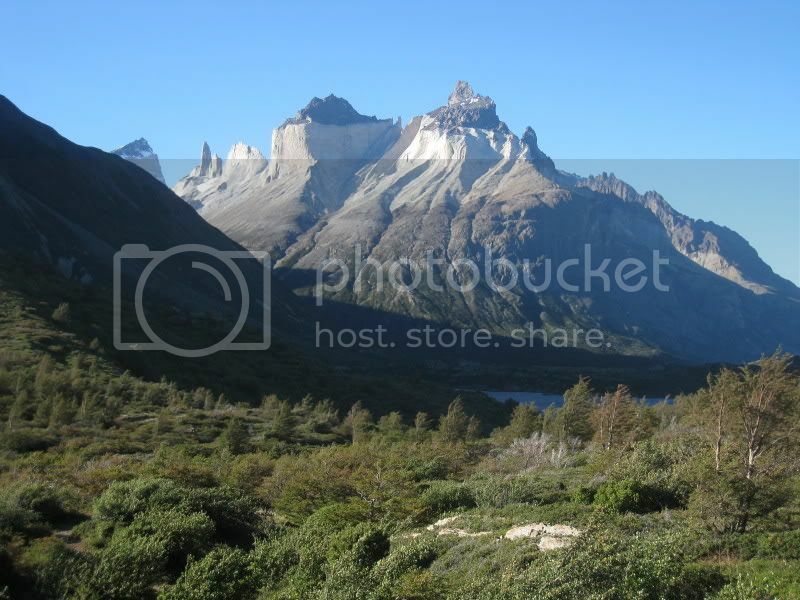 Patagonia is a vast, windy and mostly treeless plateau covering southern Chile and Argentina. 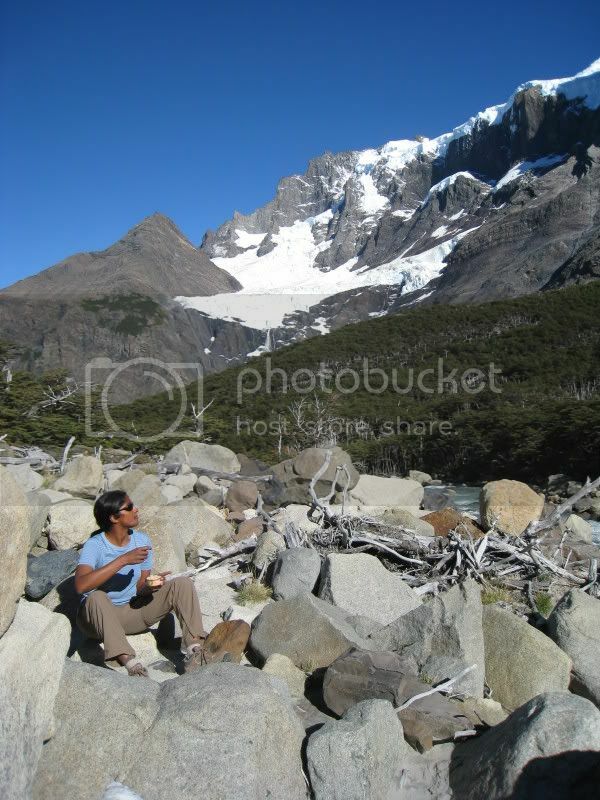 Patagonia´s appeal lies in its emptiness. 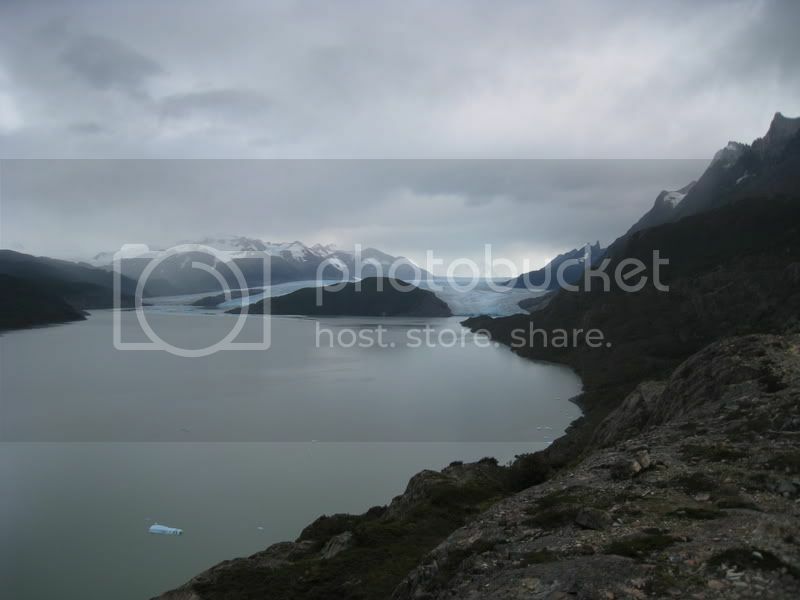 Very few people live in this large area, but it offers some spectacular scenery with glaciers, mountains and lakes. 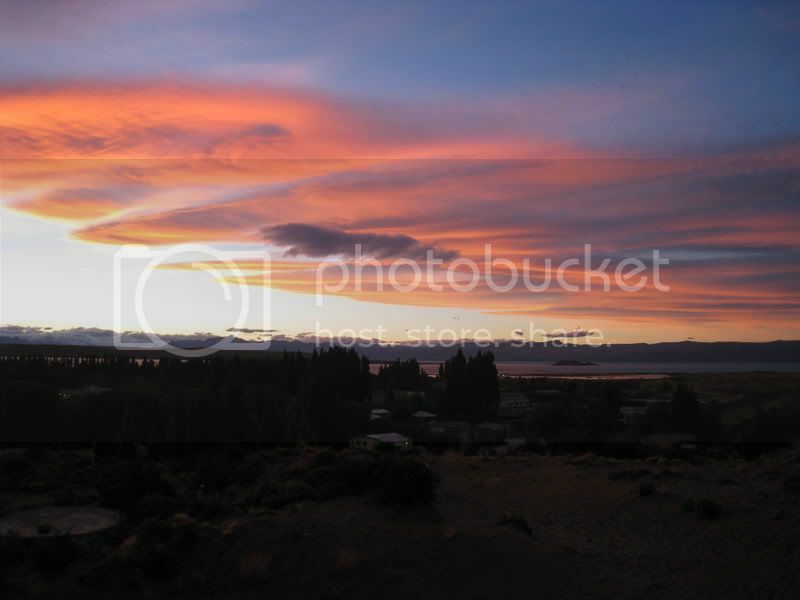 Here we are enjoying a great sunset from the patio of our hostel (America del Sur, El Calafate) looking onto Lago Argentino. Here is the same lake again at daylight. 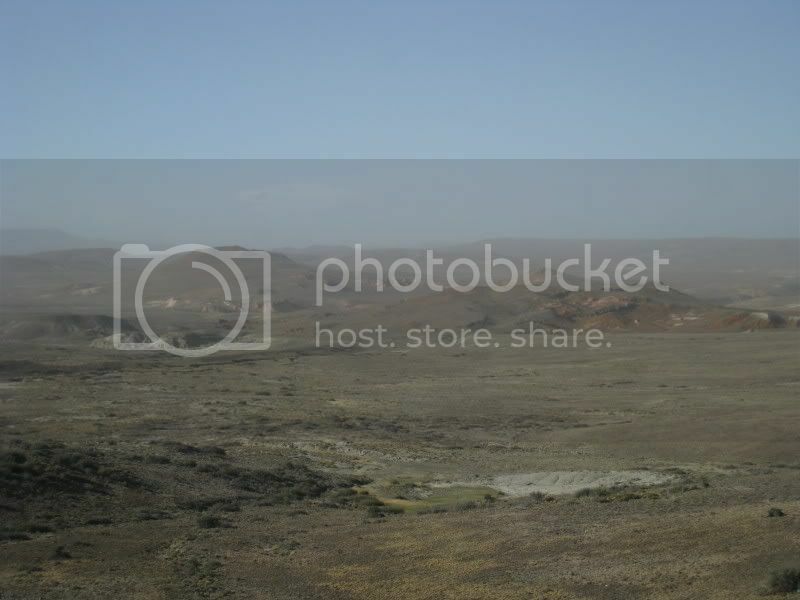 You can see the sparse vegetation, because most the time a relentless wind blows from the west. (However we actually got pretty lucky and the winds were never that strong) You will also always find those fences everywhere. The estancias (ranches) keep the sheeps and cattle on their land with those. 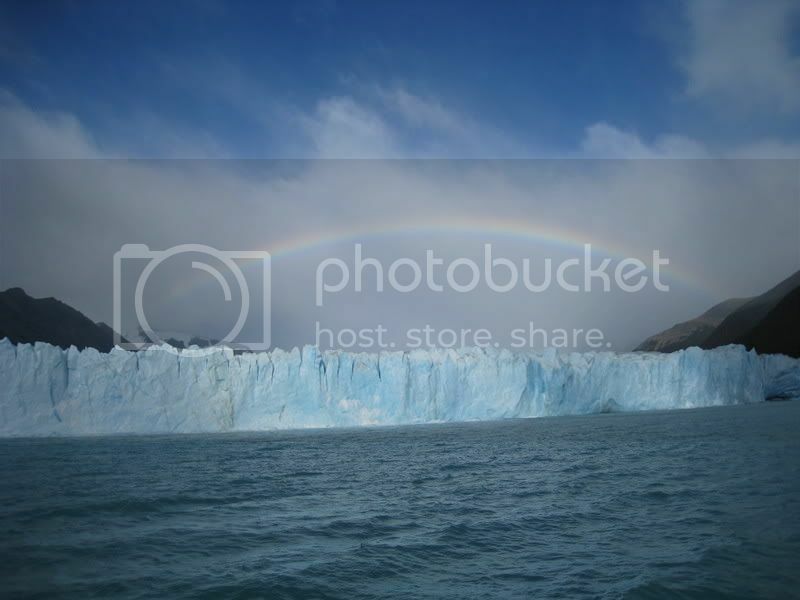 We visited the Perito Moreno Glacier in the Los Glaciares Nationalpark. 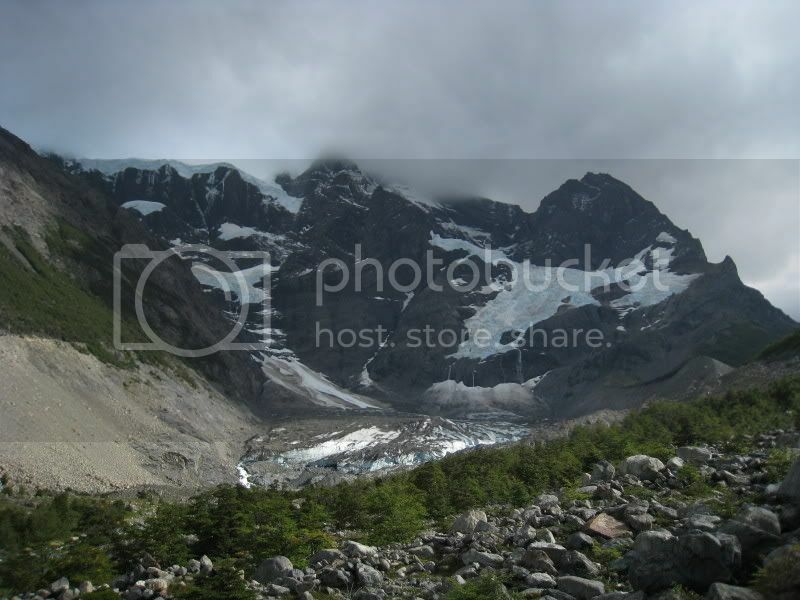 This glaciers is actually one of the few glaciers that is still growing even due to the global warming. 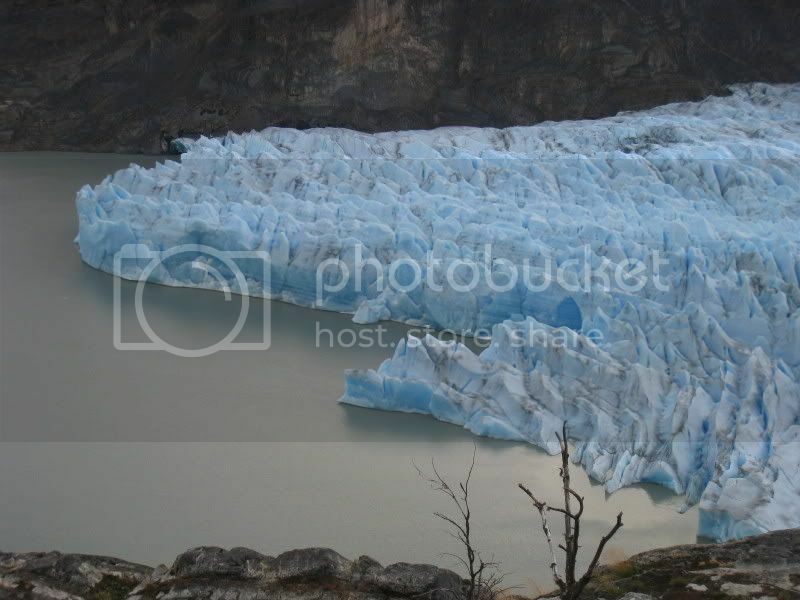 This glacier is part of the Southern Patagonia Ice Field, which is the third biggest extension of continental ice after Antarctica and Greenland. We were there at the end of March and beginning of April. The fall was in full swing and the colors were beautiful. 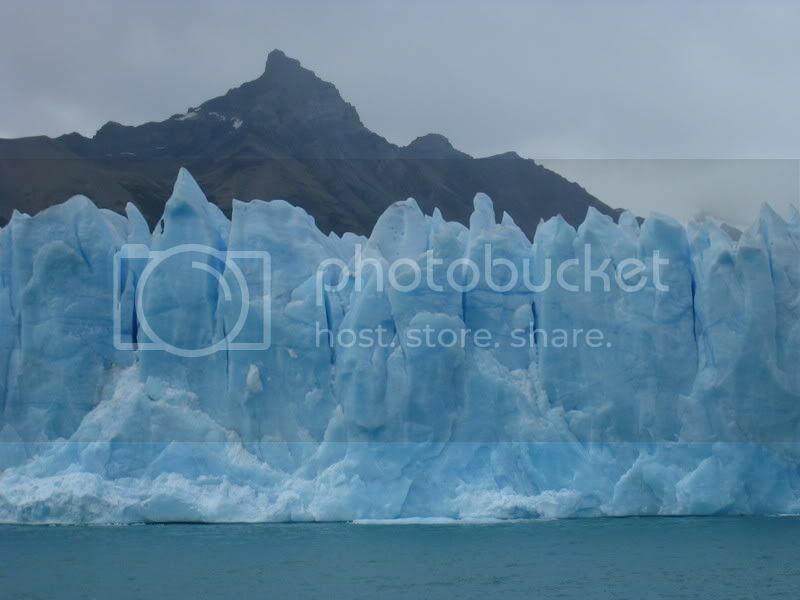 We also did a tour with the boat and you come pretty close to the face of the glacier and you realize a bit better the dimensions. 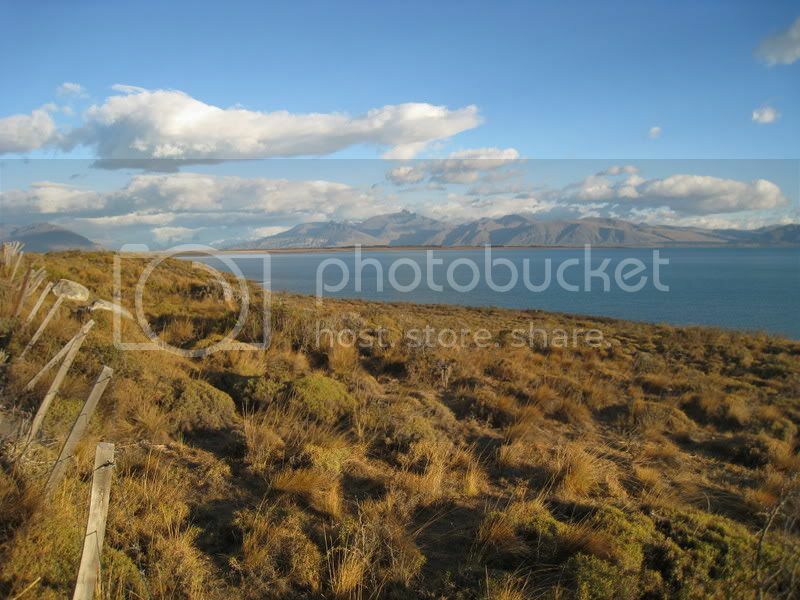 From El Calafate we crossed into Chile and went to the Torres del Paine Nationalpark. 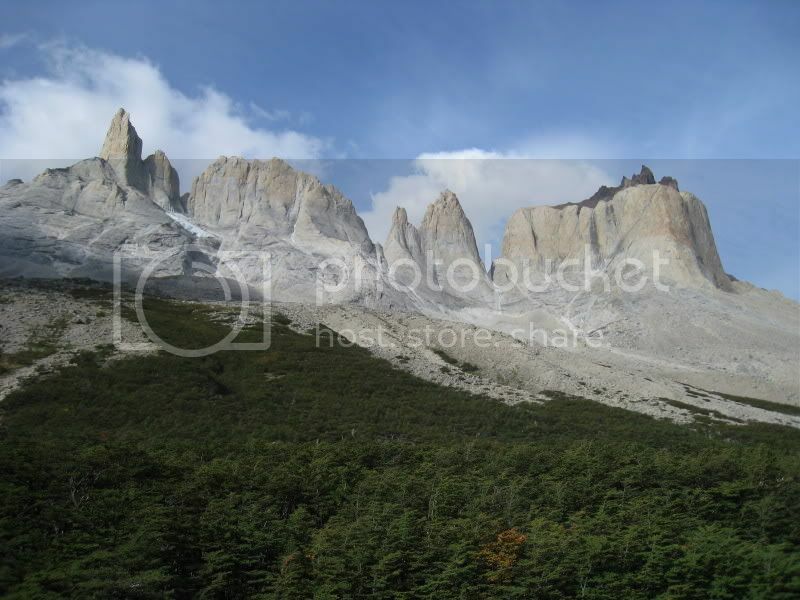 Big parts of Patagonia are flat, but at the Paine massif (and also the Fitz Roy massif near El Chalten further north) are some awesome peaks that come up from the plateau. 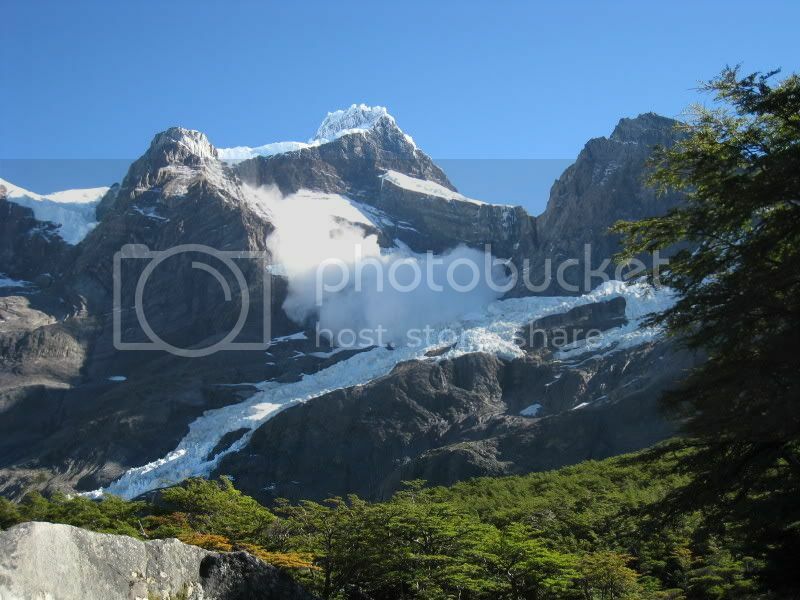 Here is the Paine massif. Lots of times the high peaks are surrounded by some clouds. 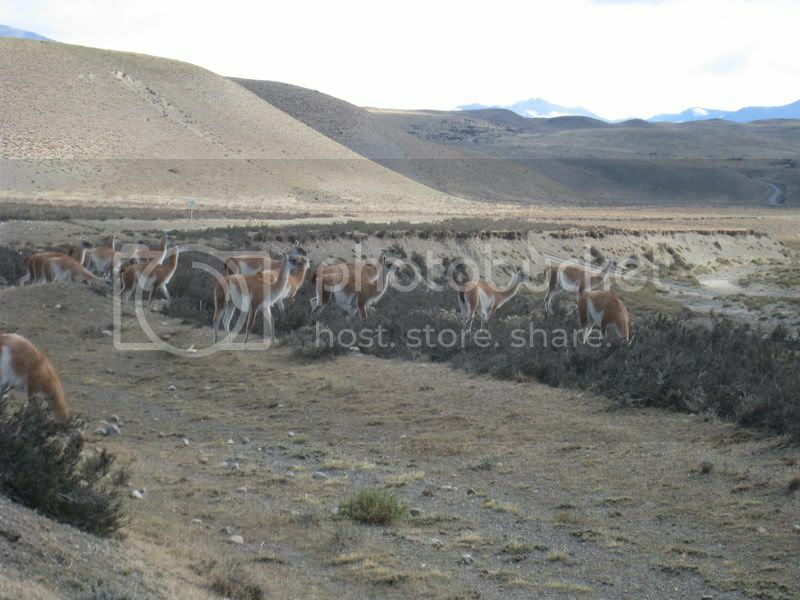 Some Guanacos we met on the way. They are similar to a lama. 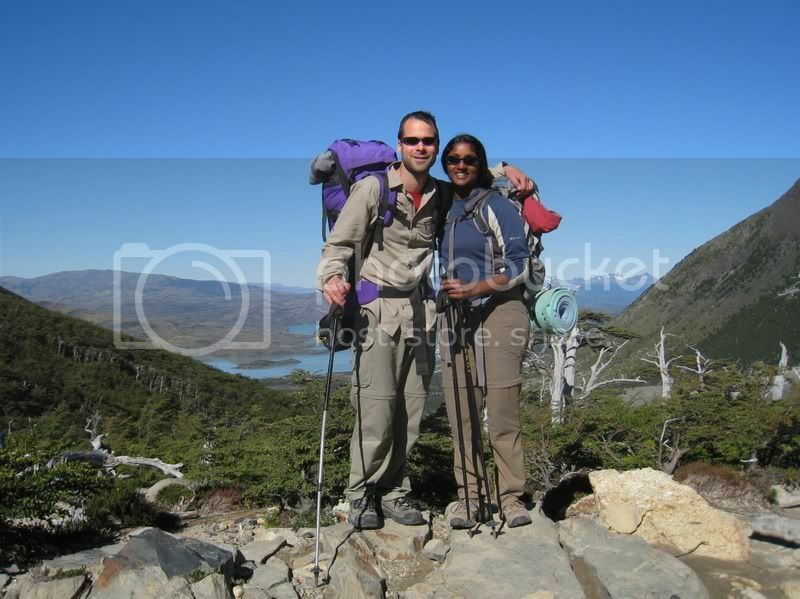 We did the W-trek which is a popular multi-day hike in the southern part of the park. We did the whole route in 6 days (and spent 5 nights camping). 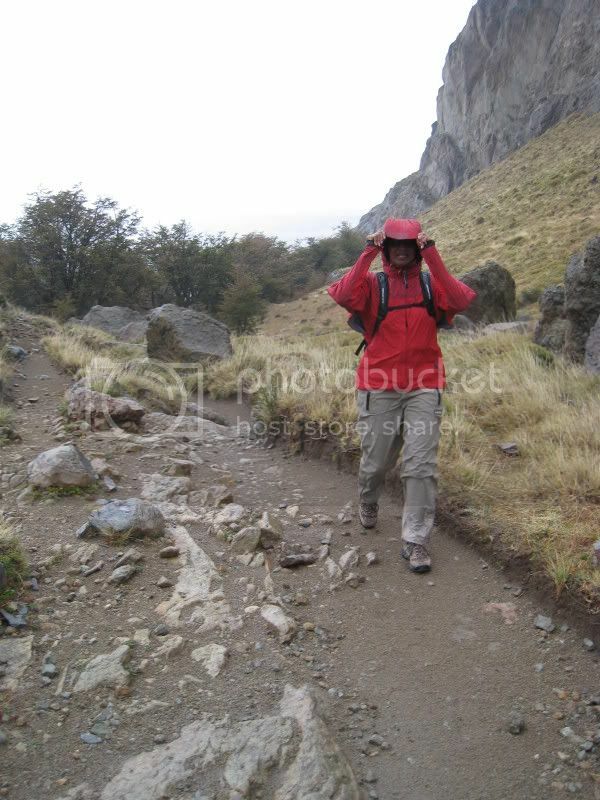 Here we are hiking during the first day up to our first camp (Campamento Torres). 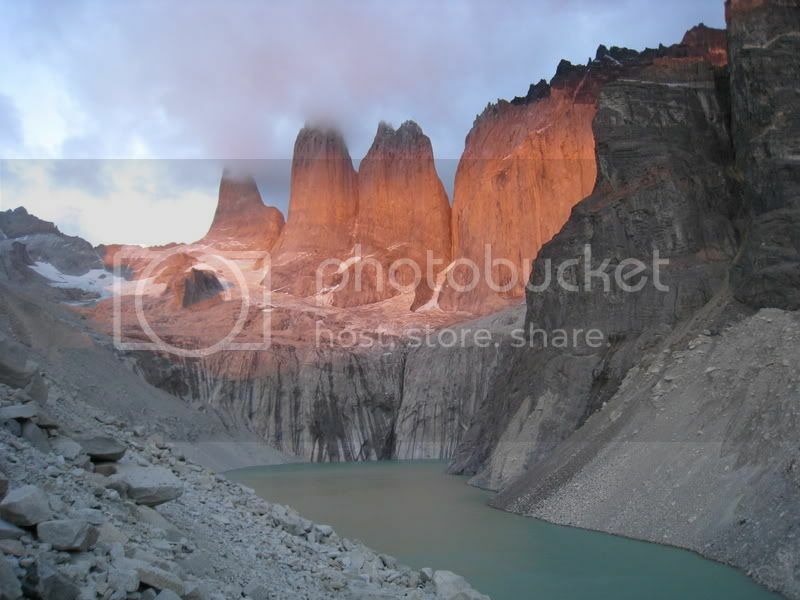 Next day we got up early to see the towers lit during sunrise. It was totally worth it to wake up early and hike with headlamps up to the base of the towers to see them lighting up in orange and red. The red/orange colors only last for a few minutes before they change over to the more common view. 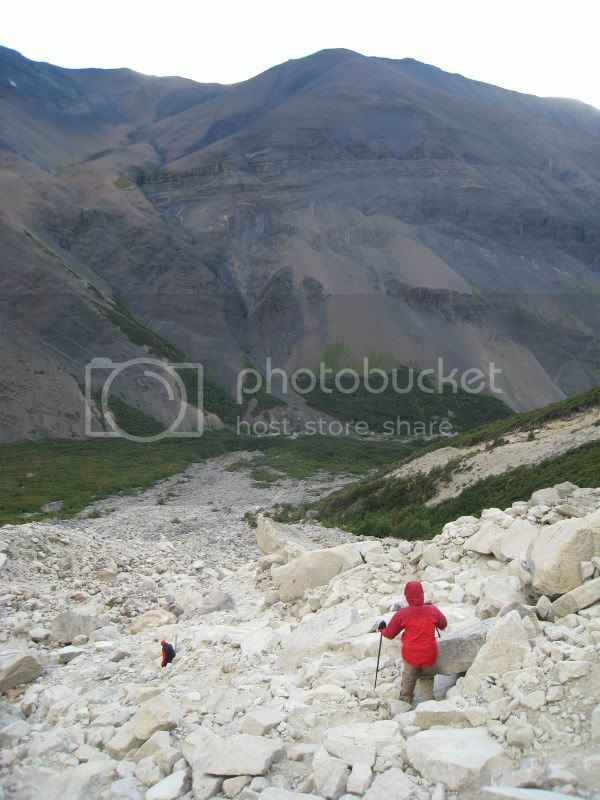 You have to work your way up and down quite a steep boulder field to get to the towers. 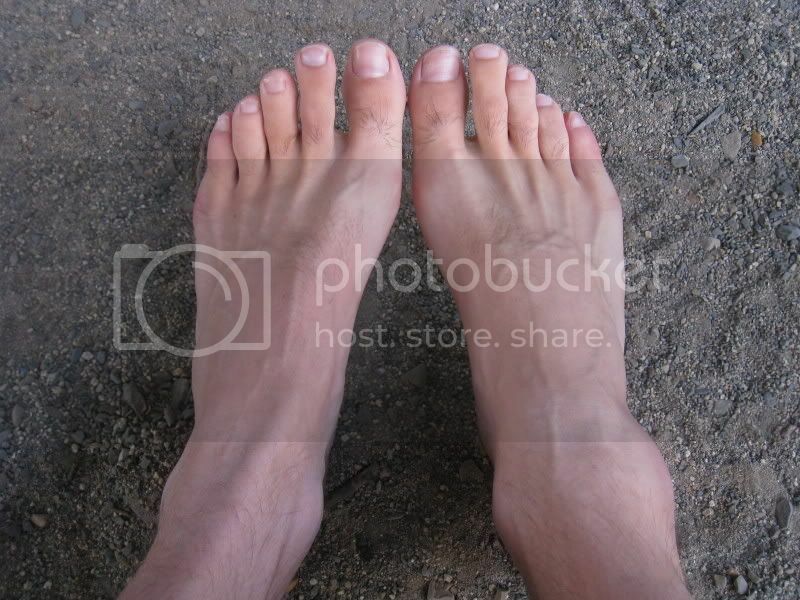 Unfortunately I did not pay enough attention for a split second and severly sprained my ankle. 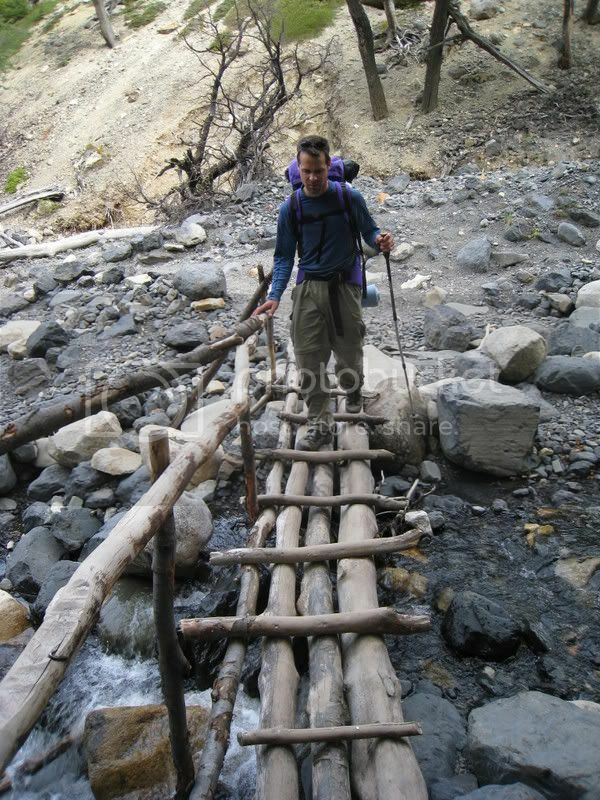 It swolle up quite big but luckily it did not hurt too much and I could continue hiking. 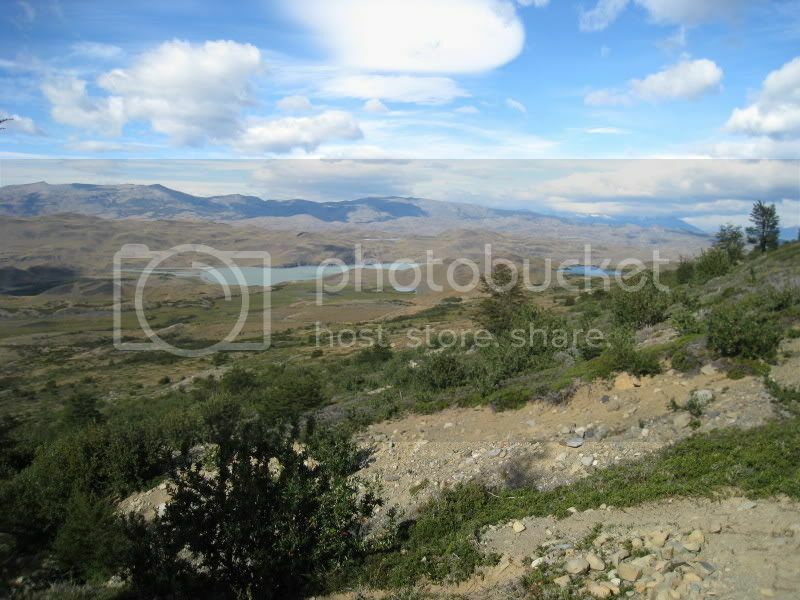 The views during our second day onto the steppe and rolling hills south of the Paine massif. There are often some stream crossings that make things interesting. 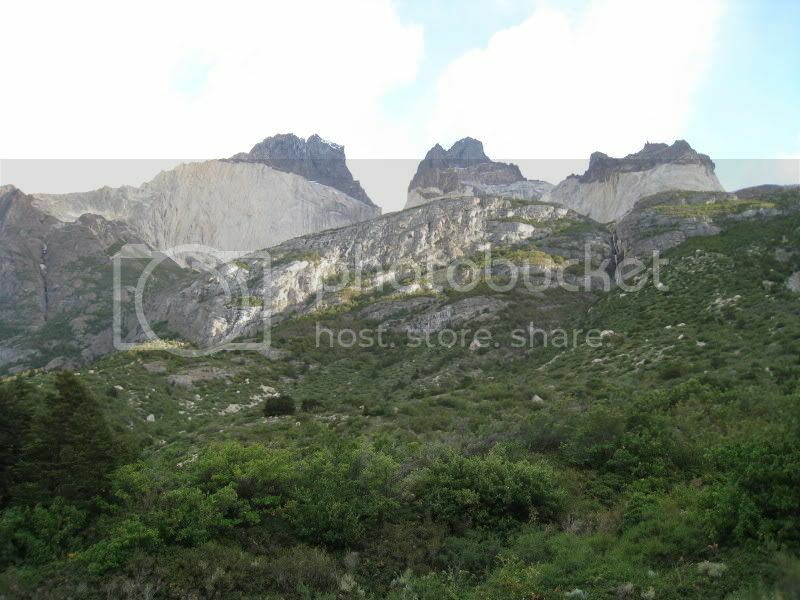 View of the “Los Cuernos” (=Horns) from close up at our campsite. A bit a different perspective than the famous ones you will find on lots of brochures. 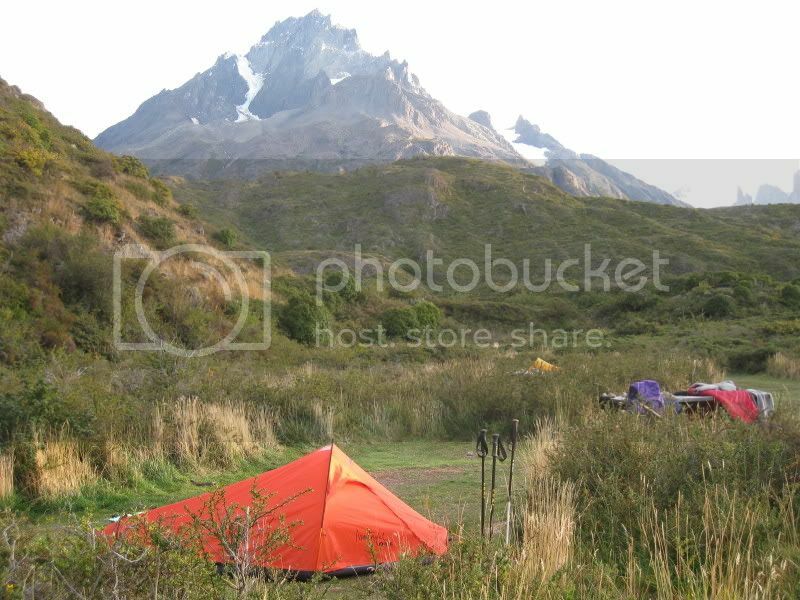 Campsite at Los Cuernos. We bought a tiny (but light!!) 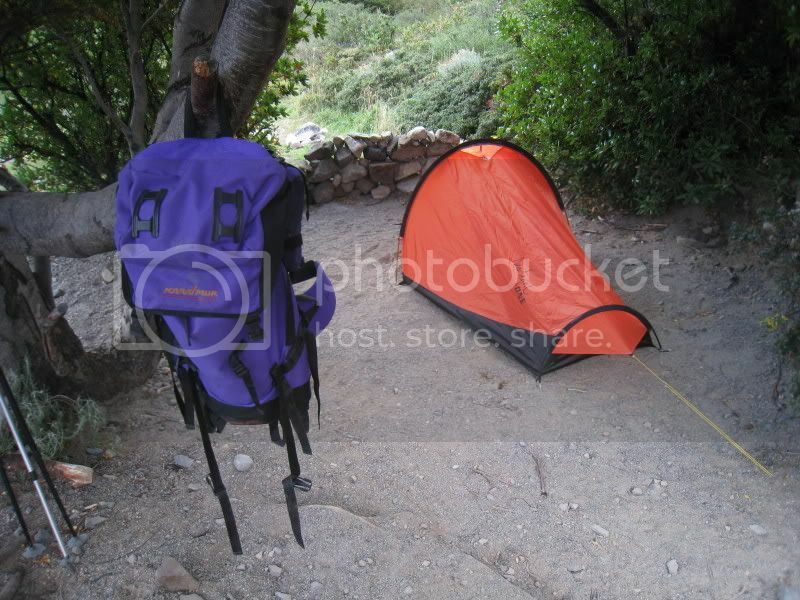 1-person tent in Buenos Aires. The weather was great for 5 out of the 6 days and I actually slept 3 nights outside. It was great to hear the wind blowing and wake up and see the stars. A nice beach we came along on the 3. day. However the water is a bit cold for a swim. 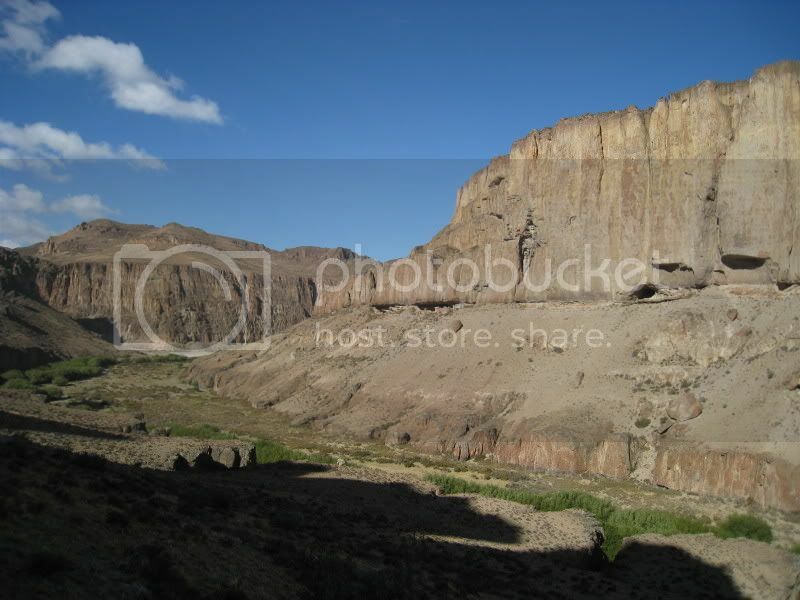 In the background you see the entrance to the French Valley. 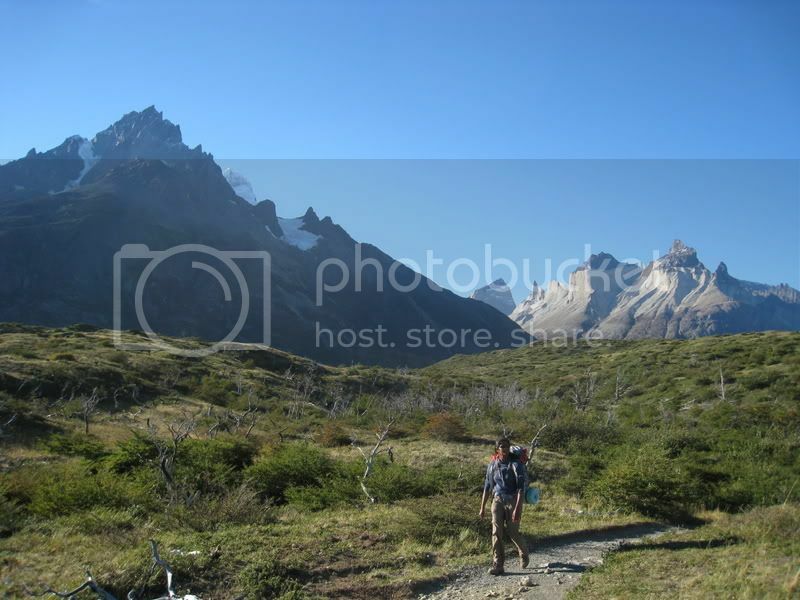 The hike up into the French Valley is quite steep in some places but the views are spectacular. There were only 2 other tents up there at campamento Britanico (campsite in the French Valley) and it was a great setting. However it was a bit windy and we had to cook inside our tiny tent. Next day we got up early for the sunrise. On the hike out we took a lunch break right under the glaciers. Every once in a while an ice piece broke off and came roaring down with lots of noise. Here we caught a huge break off on camera that sent a big ice cloud down valley. It was very impressive! 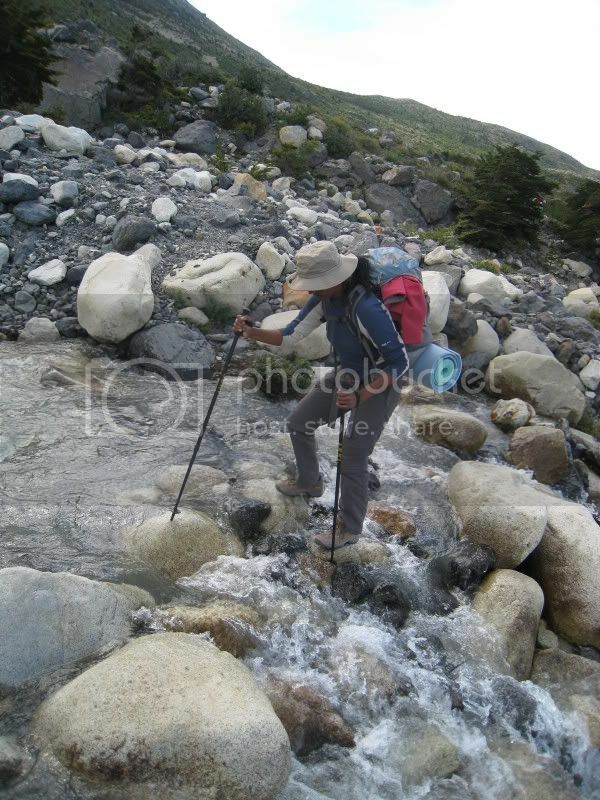 They say when you go trekking in Torres del Paine Nationalpark you have to be prepared for the worst (wind, rain, snow etc.). We however caught the perfect weather window and enjoyed fabulous weather. During the 6 days we had 5 days with sunshine and only one day with a slight rain drizzle. Many days we did not even see a cloud in the sky. We can highly recommend the W-trek (or if you have more time the whole circuit). The scenery gets better and better by the hour during this trek. A close-up of the “Los Cuernos”. 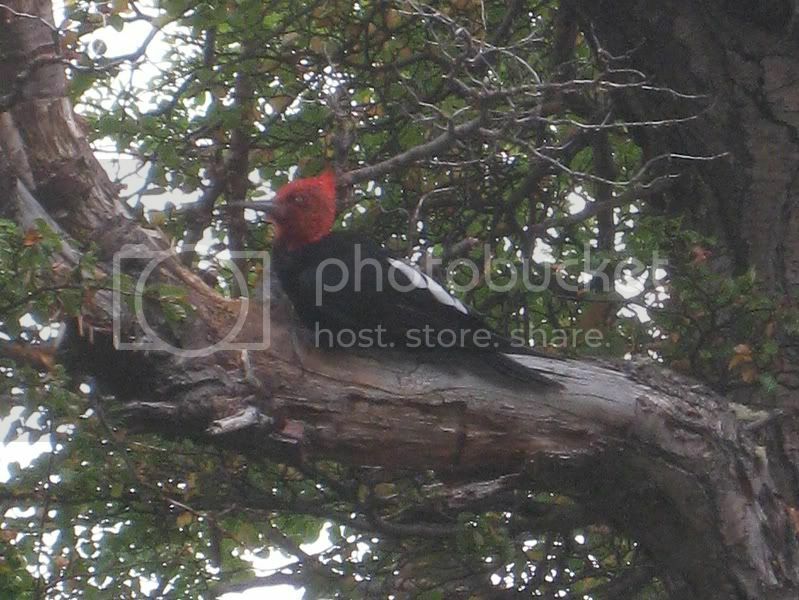 A woodpecker we heard hacking away in the trees. 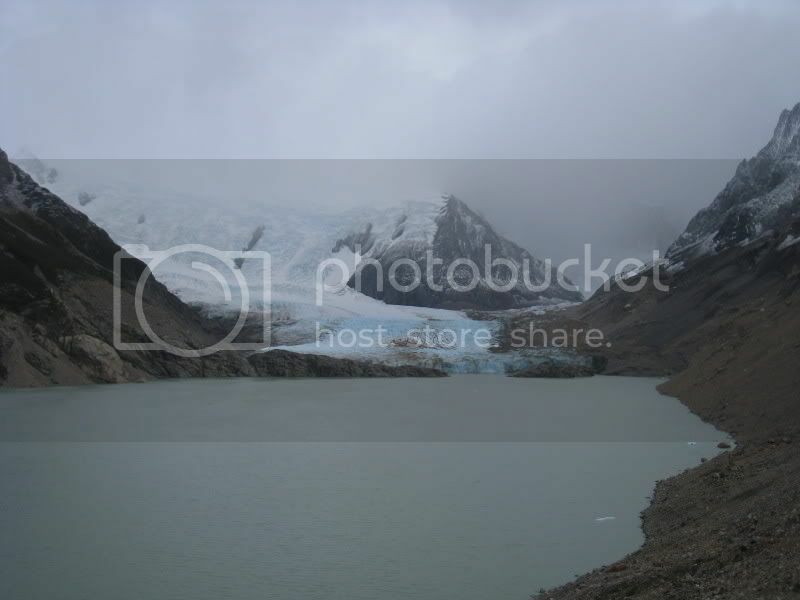 First look at the grey glacier. 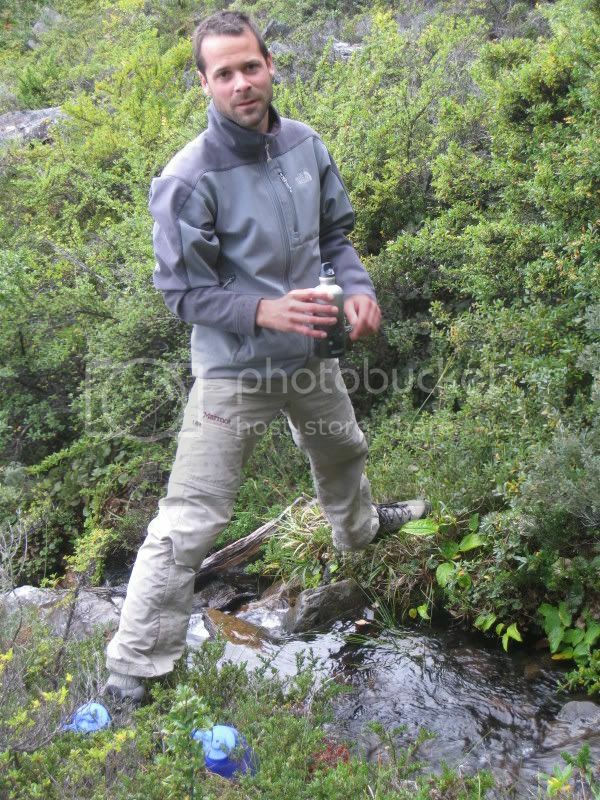 One of the best things when trekking in Patagonia is that you can drink untreated water right from the stream. 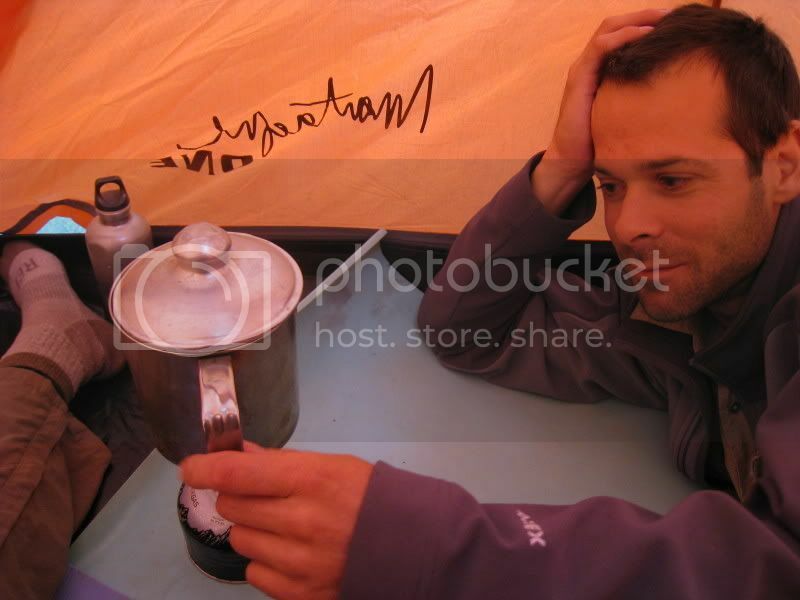 You just have to be a bit smart and not fill up your bottle in a lake or not just downstream of a campsite. No need to carry a water filter or to lug around tons of water. Just fill up your bottle every few hours and you will enjoy some of the best water you ever drank. Here I fill up all our bottles before we get to the campsite; but usually we did not carry more than 1.0 litre for the both of us since you come across a perfect stream about every half an hour. 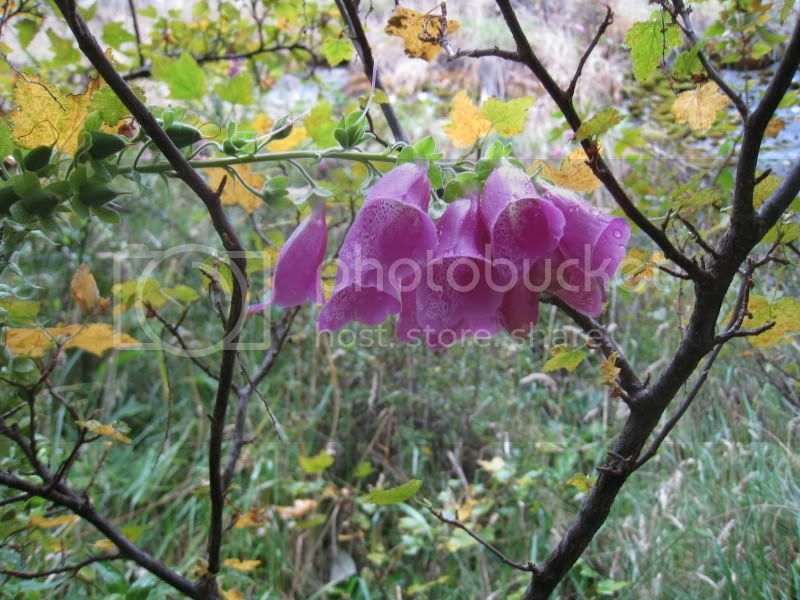 Jaya always finds some nice flowers along the way. 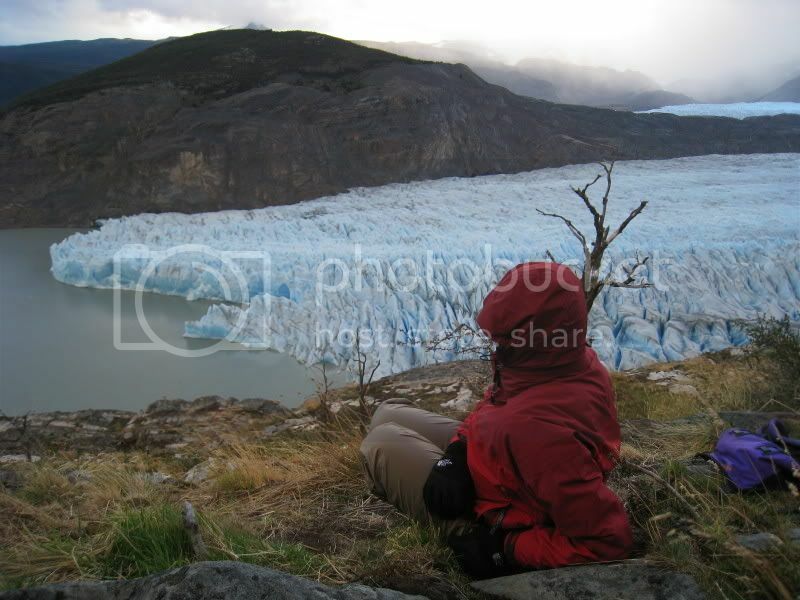 The campsite Los Guardas is just above the Grey glacier and we hung out there to see if we can witness some more ice beak offs. 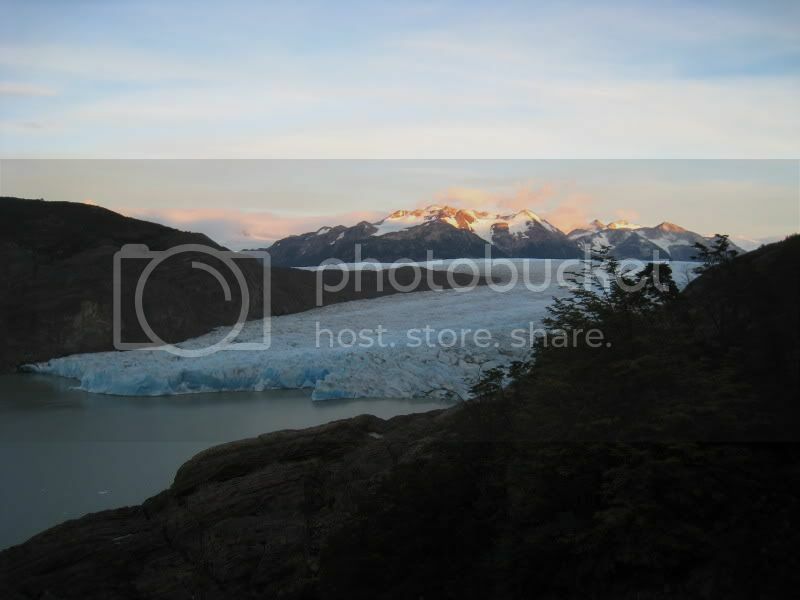 However this glacier was not as active as the Perito Moreno glacier and nothing broke off right then, but it was still great to just soak in the evening. 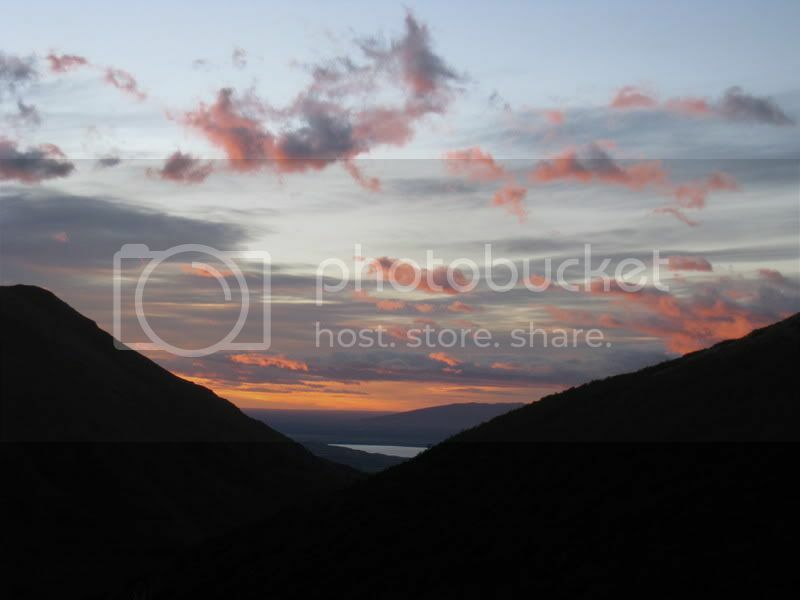 On our last day we hiked back in high spirits to the Pehoe camp when the sun was rising. 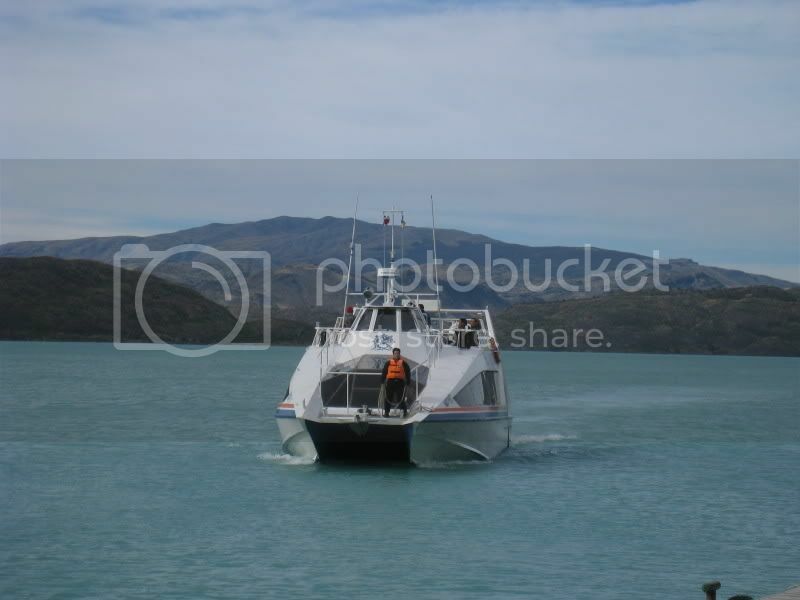 There we caught the ferry and went then back to El Calafate with the bus. Last look back at the Paine massif. 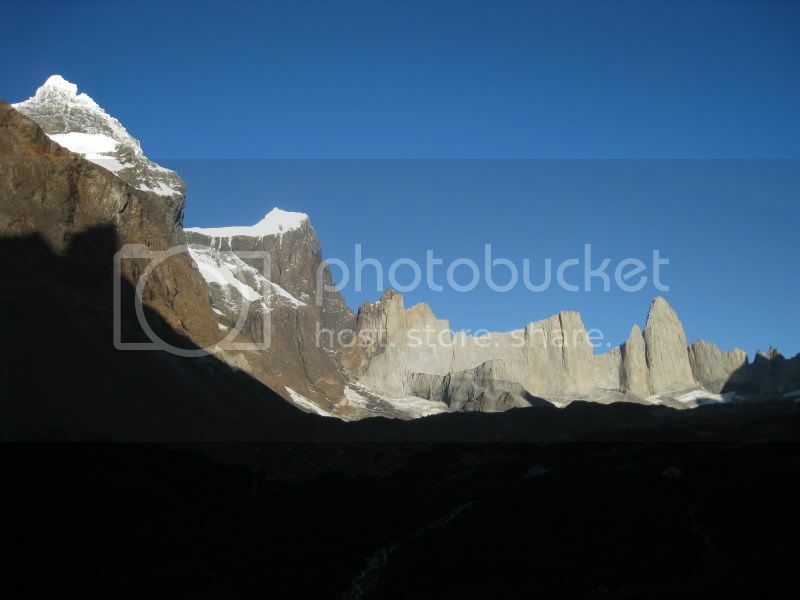 From El Calafte we headed north to El Chalten where the mighty Fitz Roy and Cerro Torre massif is. The weather was just so so and we decided to do some short hike around town. 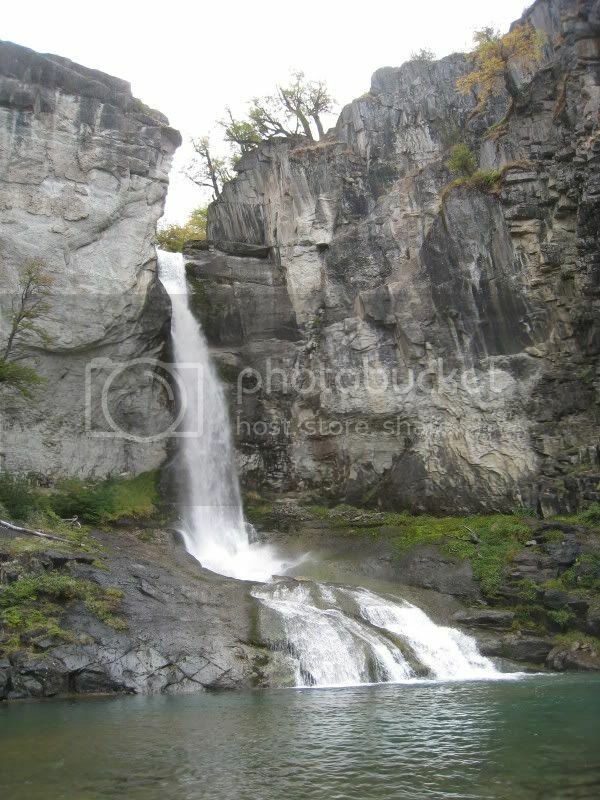 Here is the Chorrillo del Salto. The next day we still could not see the mountain peaks due to thick clouds. 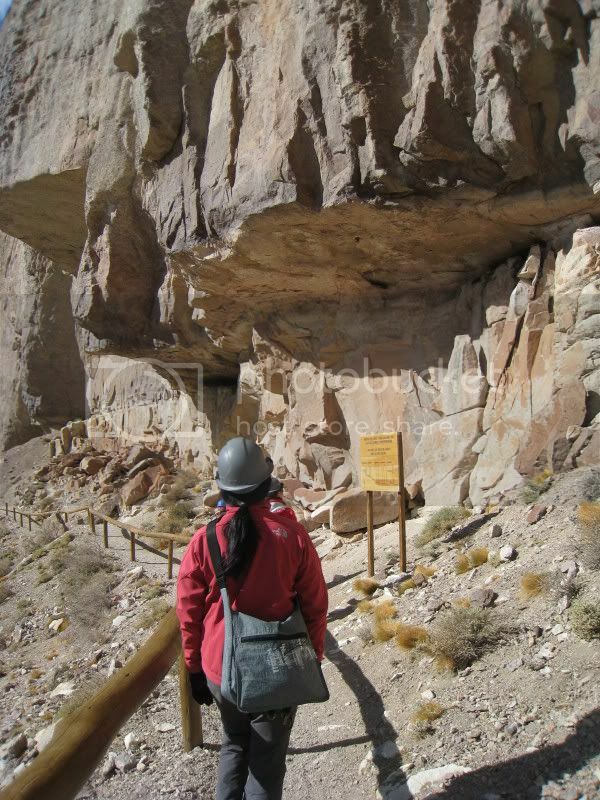 We still decided to head out and make our way up to laguna de los tres. However strong winds picked up and the rain came down very hard. After an hour of miserable weather Jaya had enough and decided to turn back. I carried on as sort of training and went all the way. 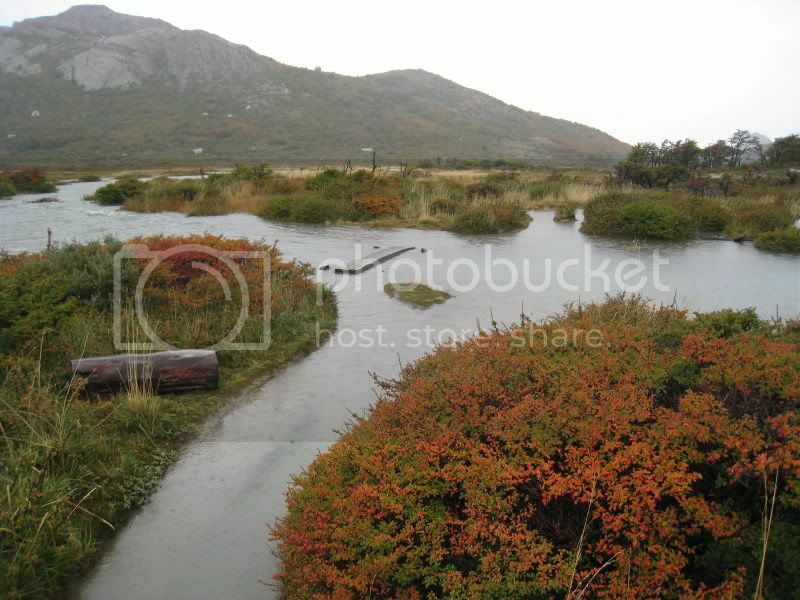 The hiking trails were flooded at some places and streams came across the plaines. But it was still good fun! 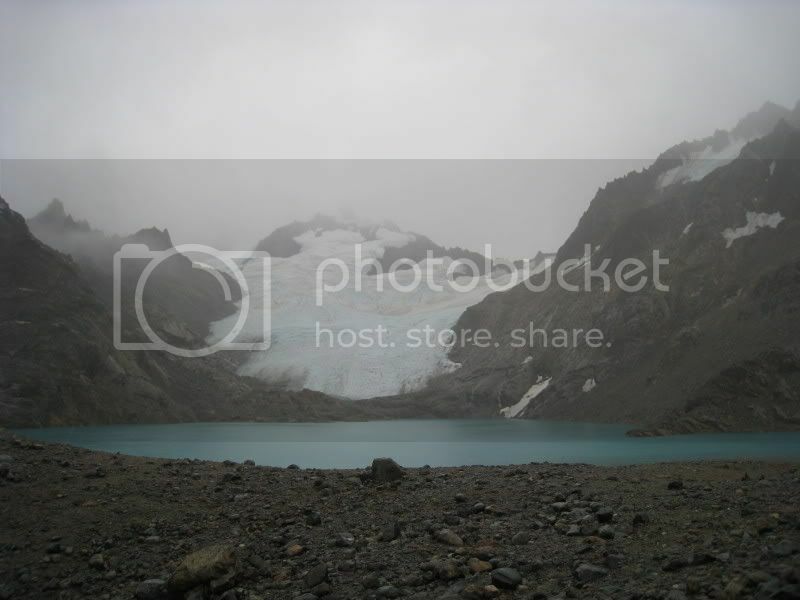 Here is the Laguna de los tres. 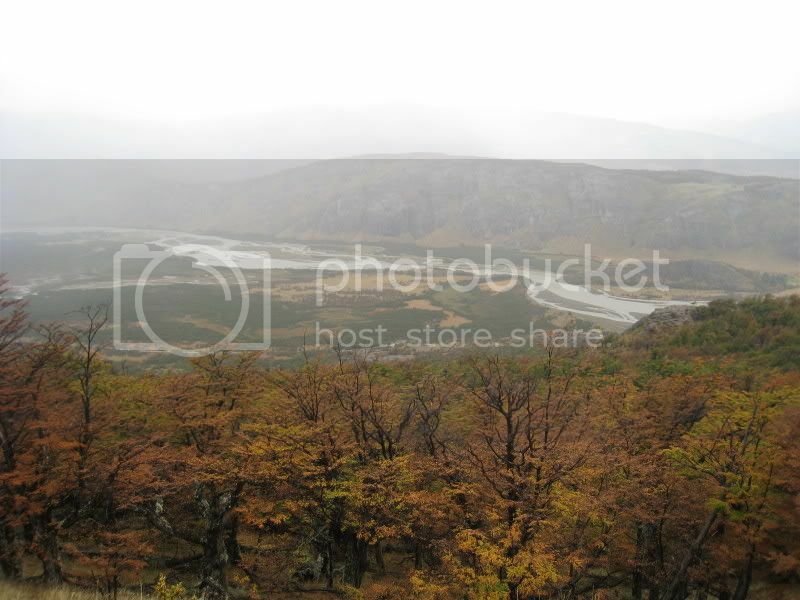 In the background would be the mighty Fitz Roy but unfortunately all I could see was a wall of white and grey. The views down the valley were still good, however the fall colours would be a lot nicer with a bit of sunlight. Another day went by and the thick clouds around the high peaks did not want to vanish. 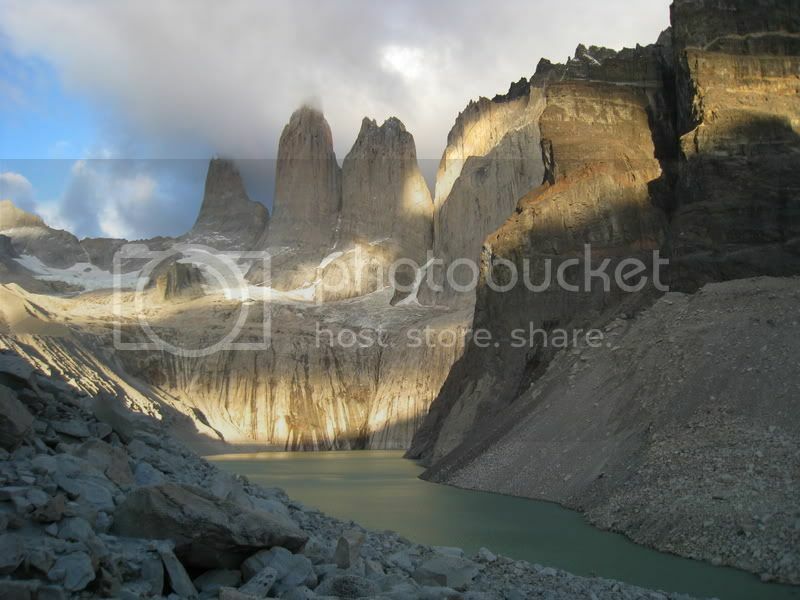 The weather was a lot friendlier though and we hiked up to Laguna Torre. Cerro Torre would rise here somewhere in the background, but it did not want to come out. 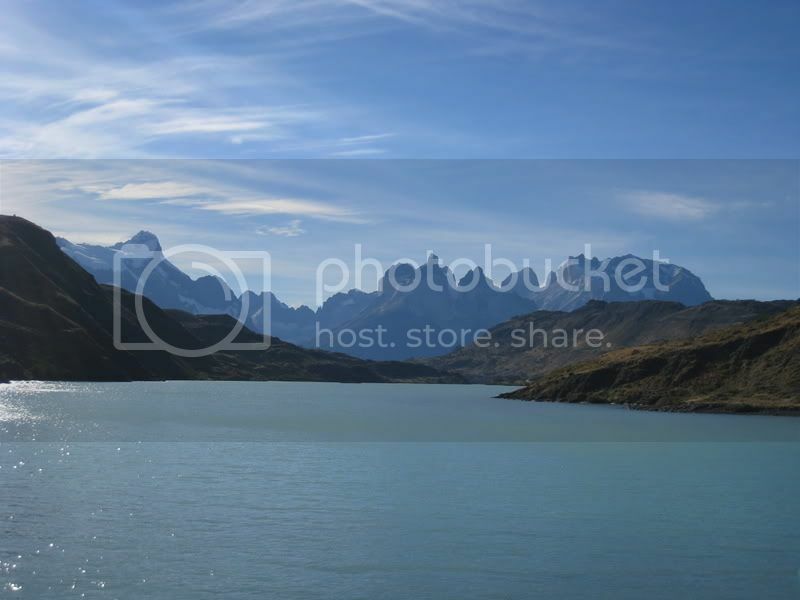 We had the perfect weather in Torres del Paine Nationalpark and thought this is now payback. 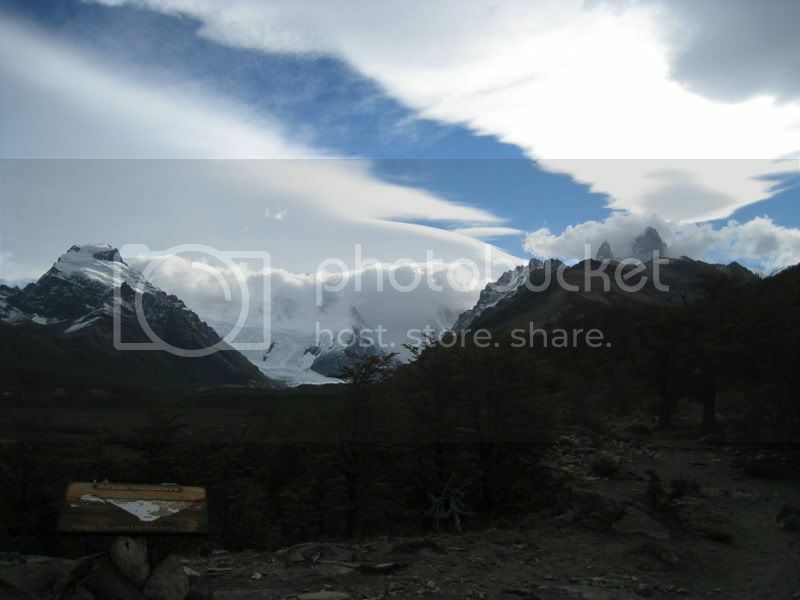 But fortunately the skies started to clear on our way back to town and we could catch a glimpse of Fitz Roy. 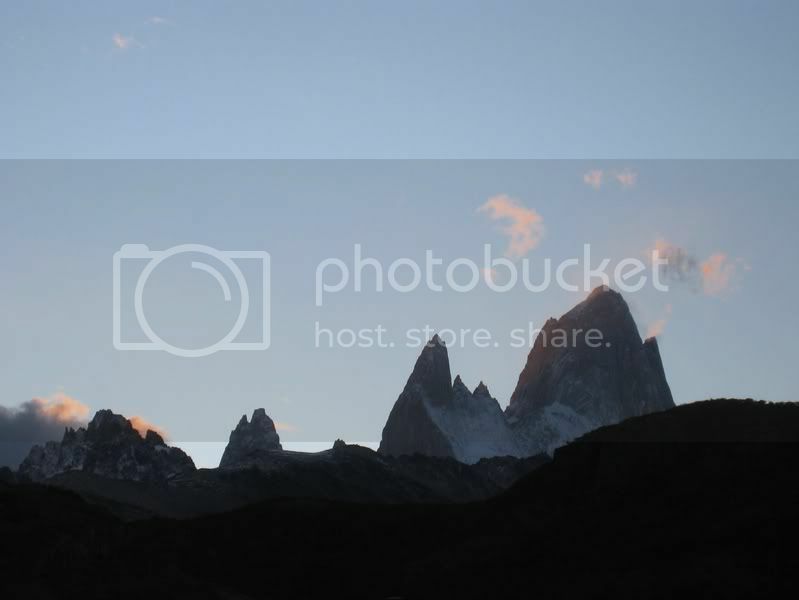 In the evening the sky cleared up all the way and the last sunrays lit up Mount Fitz Roy. 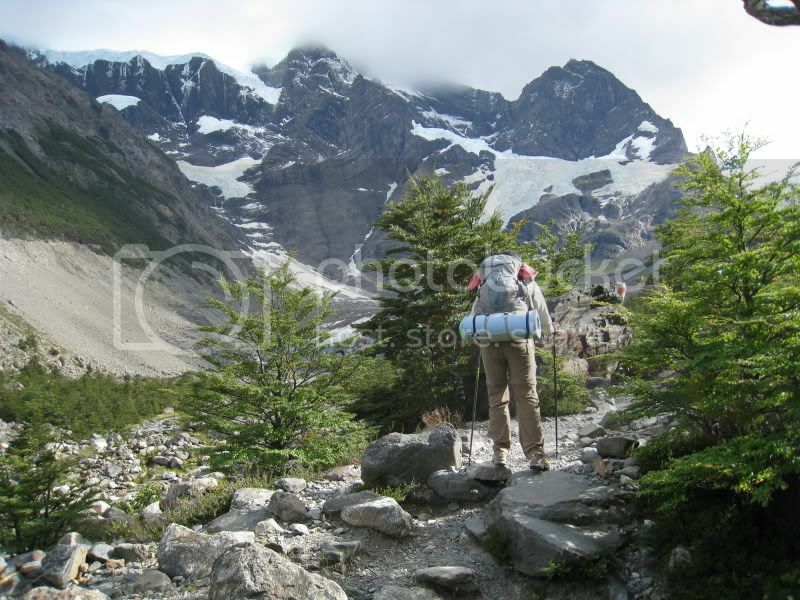 This way we still could say happily goodby to El Chalten. 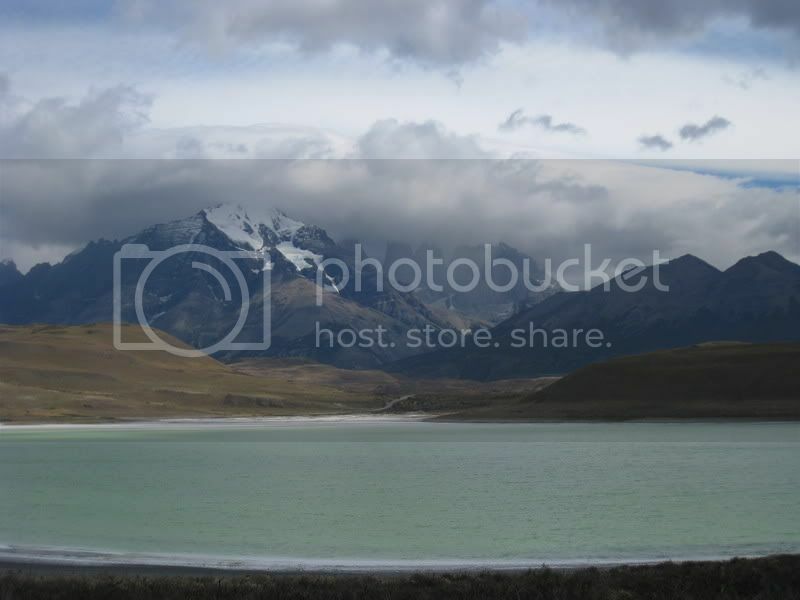 A grueling 12hour bus ride on Ruta 40 was on tap next. 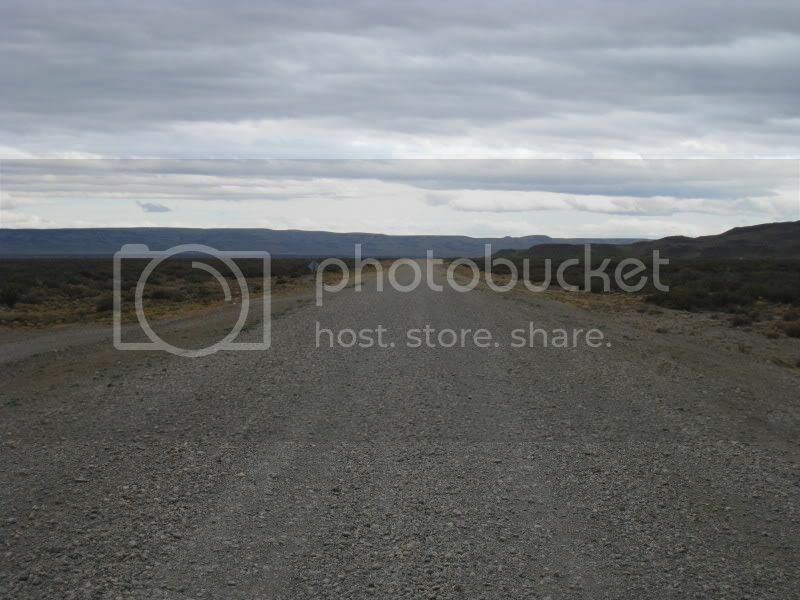 This is a quite bumpy gravel road that heads from north to south in Patagonia along the border to Chile. An old lousy bus did not really help to make this journey more enjoyable but we survived. 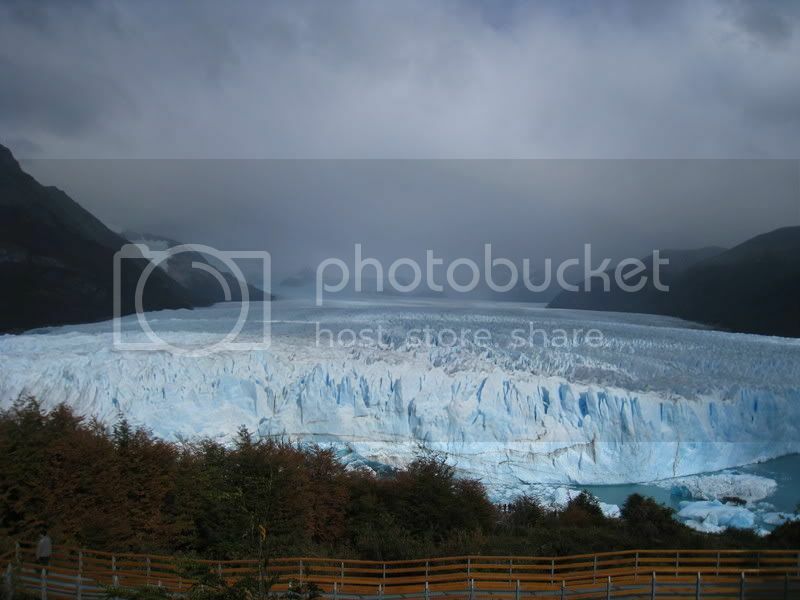 From the town Perito Moreno we did a one-day excursion to the “Cueva de las Manos”. 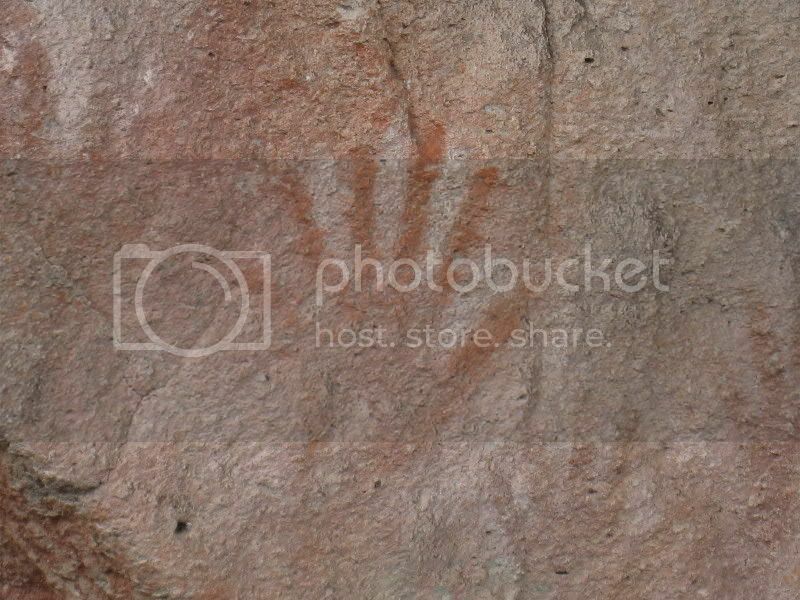 Those caves are located in a nice canyon. 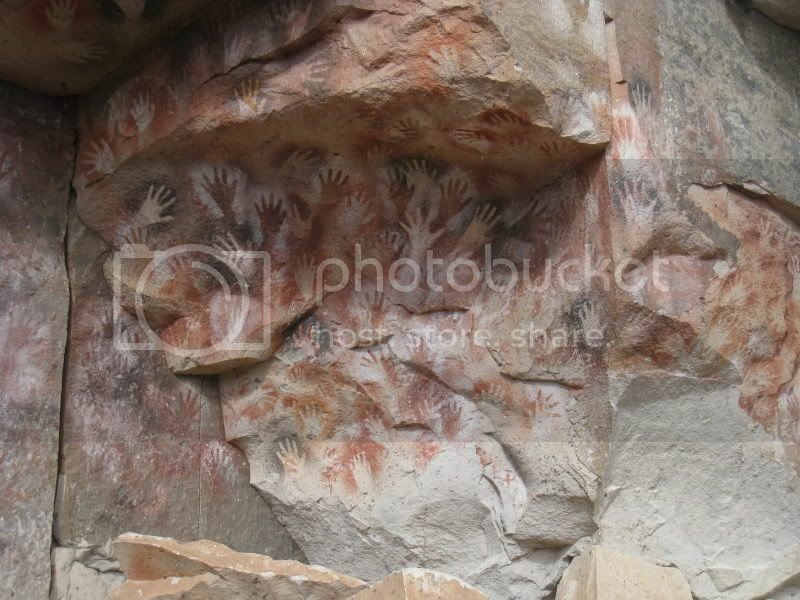 The site is famous due to the paintings of the hands that indigenous made there some 9000 years ago. We saw already quite a few Andean Condors in the Torres del Paine Nationalpark, but now I finally managed to get a decent shot of one of those huge birds. 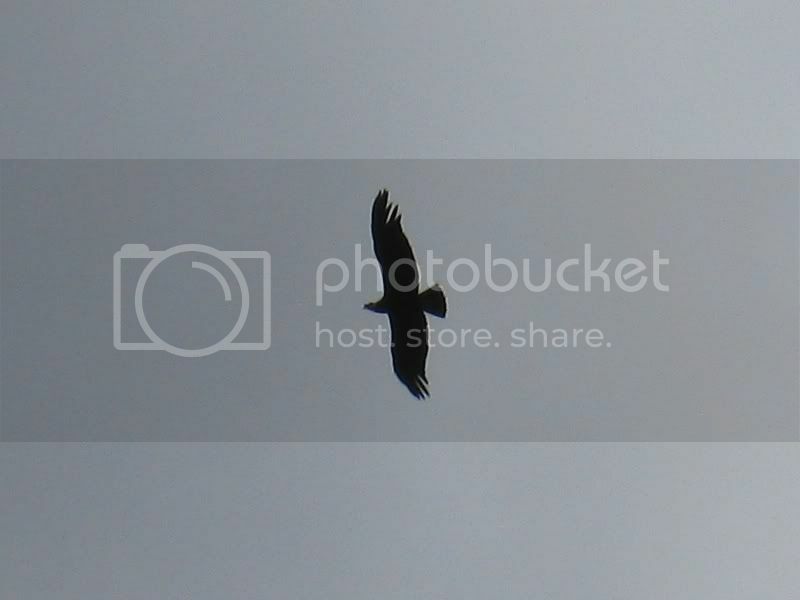 They are the largest flying land bird in the western hemisphere. The Andean Condors have wingspans of up to 3.0 meters and are a national symbol of the South American Andean countries. 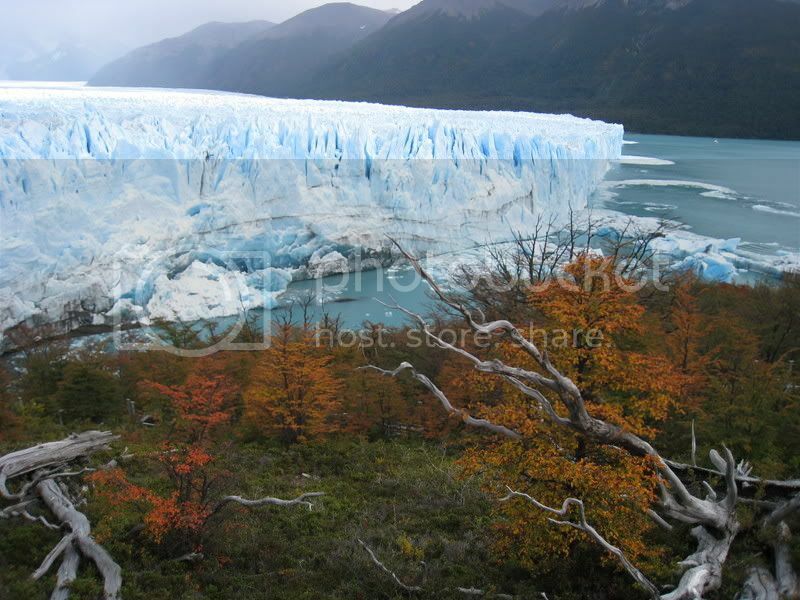 Besides the scenery Patagonia is also famous for its fierce winds. And even though we got quite lucky, on some days we could witness it. Here the wind blows lots of dust across the plains. 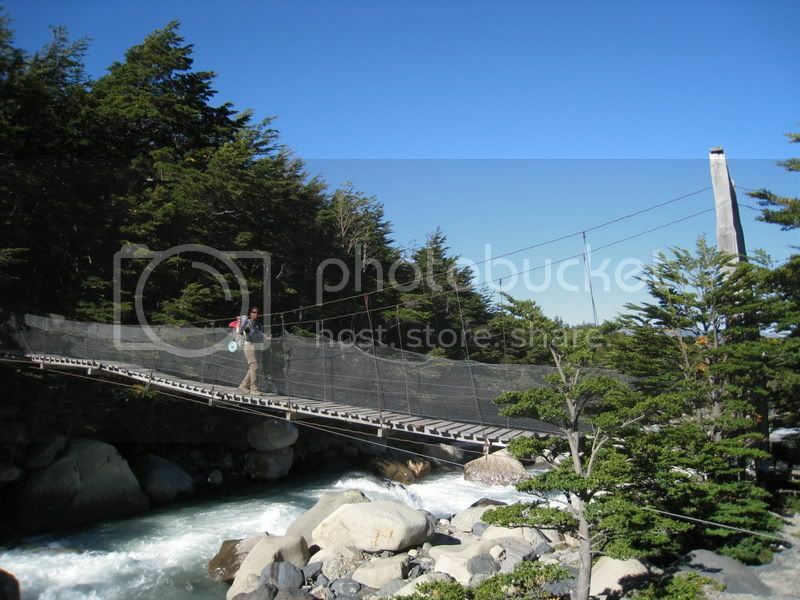 From here we crossed into Chile again and made our way north on the Carretera Austral. More on that another time. 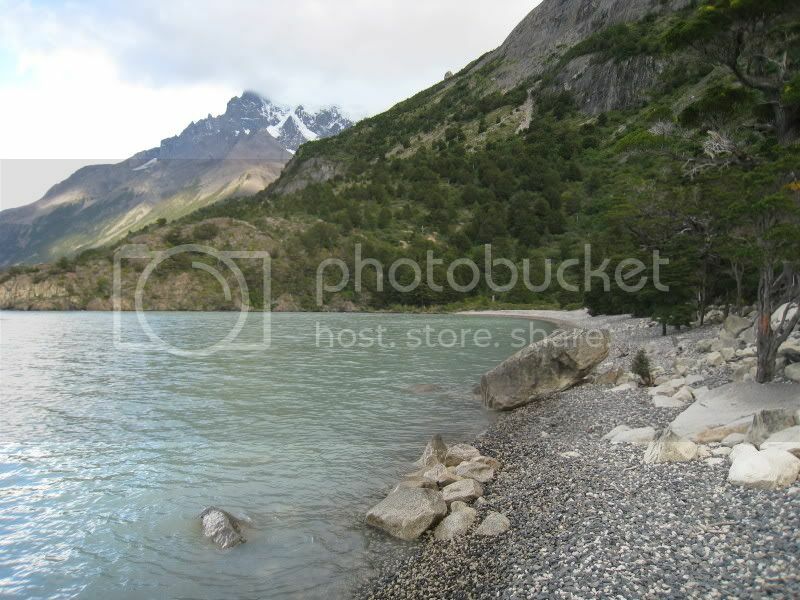 As I write this we are in Santiago de Chile and are on our way up north to La Paz (Bolivia). I could more or less update the maps and you will find the route that is covered in the blog in blue and the red will be future entries. Best online maps are found under this link: http://www.maps.live.com or check the simple Google map below.